Liver fibrosis is a multicellular response to liver injury in which hepatic stellate cells (HSCs) are responsible for 90% of extracellular matrix (ECM) production [1–5]. 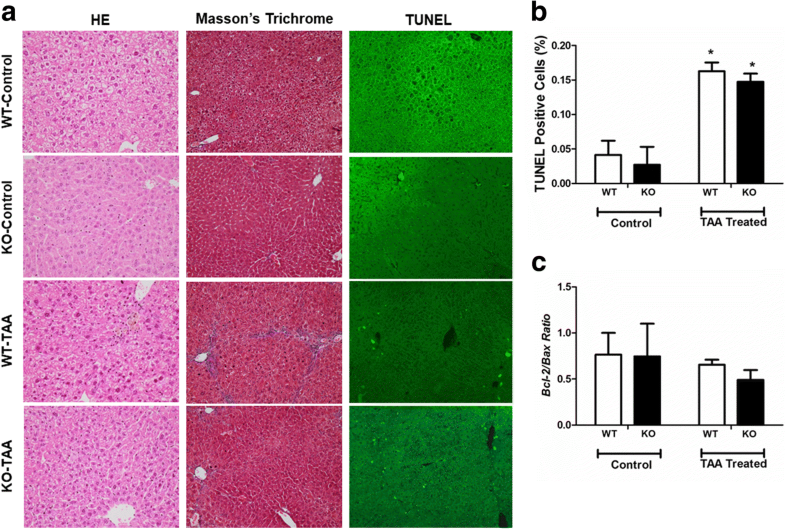 Liver fibrosis upon acute liver injury may be beneficial by providing mechanical stability and facilitating the restoration of hepatic architecture and function. However, repetitive chronic liver insults result in liver fibrosis, which may progress to cirrhosis [3, 6, 7], the major contributing factor to development of hepatocellular carcinoma (HCC) . Upon liver injury, HSCs are activated by cytokines, including platelet-derived growth factors (PDGFs), which are potent mitogens [9, 10]. PDGFs exist as five isoforms: PDGF-AA, PDGF-AB, PDGF-BB, PDGF-CC, and PDGF-DD. The cellular effects of PDGFs require the function of cell surface receptor tyrosine kinases comprising platelet-derived growth factor receptor (PDGFR)α and PDGFRβ subunits [11, 12]. Elevated PDGFR expression is observed in human cardiac fibrosis after myocardial infarct, pulmonary fibrosis, kidney fibrosis, and liver fibrosis [13–16]. PDGFR expression is very low in the normal adult liver but is significantly upregulated in HSCs in cirrhotic liver . PDGFRα participates in liver fibrosis, as evidenced by increased PDGFRα expression in cirrhotic human livers, human cell lines, and a mouse model of liver fibrosis [18, 19]. Stimulation of PDGFRα expression in HSCs induces their activation and proliferation [16, 20–23], and blocking of PDGFRα expression suppresses HSC proliferation . 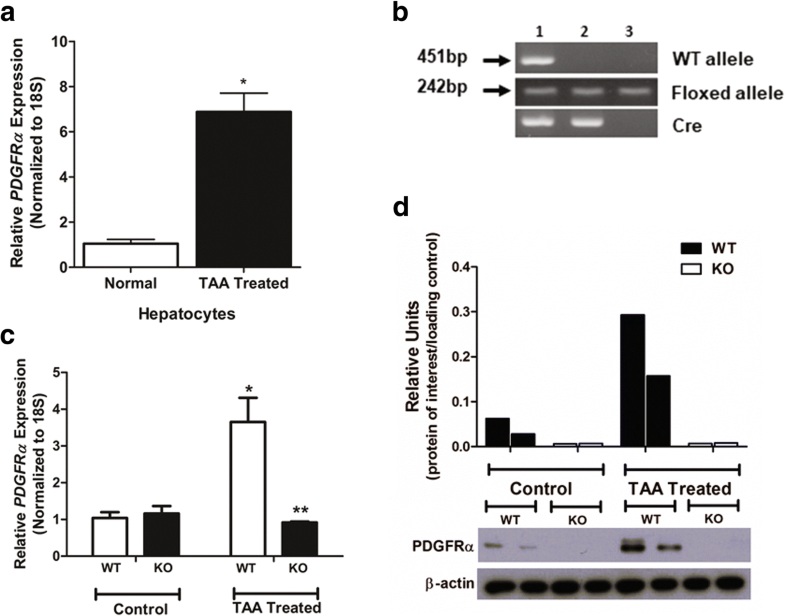 In addition, stimulation of PDGFRα expression by excessive production of PDGF-CC induces liver cirrhosis and HCC in PDGF-C transgenic (Tg) mice [25, 26]. 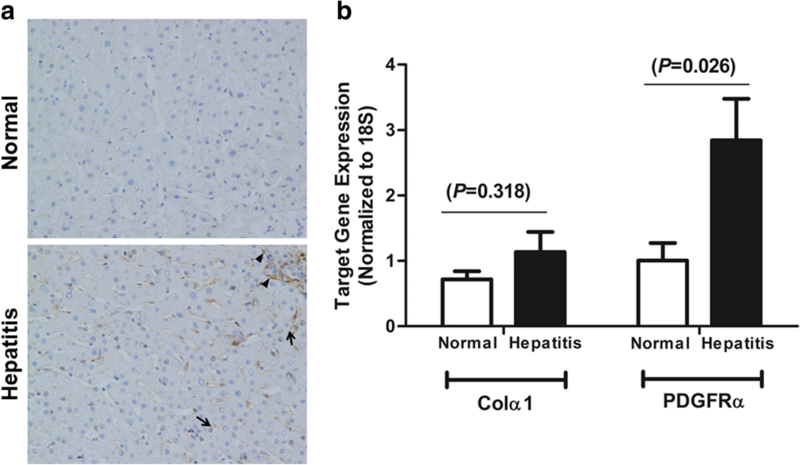 PDGFRα expression in the liver is markedly increased in PDGF-C Tg mice, although the responsible cell type is unclear. Elevated levels of TGFβ are seen in liver fibrosis and TGFβ overexpression results in liver fibrosis [48, 49]. 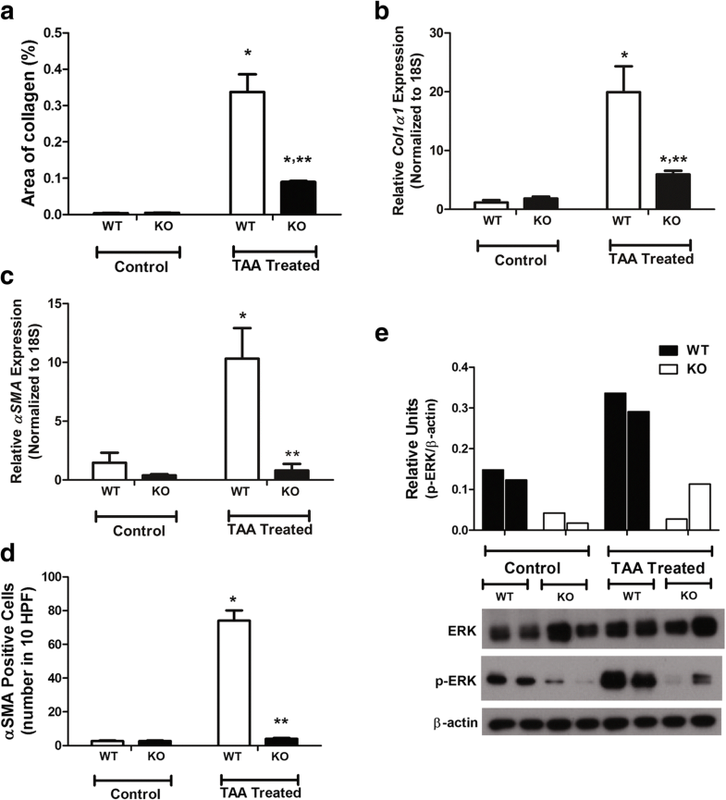 TGFβ binds to cell surface receptors to initiate intracellular signal transduction pathways, including activation of Smad proteins [50–52]. Smad2 and Smad3 form complexes with Smad4 to activate gene expression. Smad7, an inhibitory Smad, disrupts receptor activation of Smad2/3, which inhibits TGFβ signaling in a negative feedback loop [53–55]. Activation of PDGFRα ligands by excess PDGF-C upregulates TGFβ/Smad3 signaling to facilitate liver fibrosis and blocking of Smad3 signaling attenuates PDGF-C–induced liver fibrosis . Deletion of PDGFRα in hepatocytes results in upregulation of TGFβ and Smad2/3 expression in the whole liver. However, this increase in TGFβ and Smad2/3 expression is offset by overexpression of Smad7, resulting in attenuation of TAA-induced liver fibrosis. The cellular source of elevated TGFβ, Smad2/3, and Smad7 in the liver after hepatocyte PDGFRα deletion is unclear. However, co-culture of PDGFRα-deleted hepatocytes and normal HSCs resulted in significant upregulation of TGFβ and Smad2/3 expression in HSCs and maintenance of Smad7 expression.